Manufactured using strong stainless steel, our two burner range is highly acclaimed by the clients. This burner comes with 2 different types of burners, a chines and an indian burner, both mounted on the same level. We make sure to make these available at industry leading prices. Being a quality oriented organization, we are involved in providing supreme quality range of 2 Burner Gas Stove. 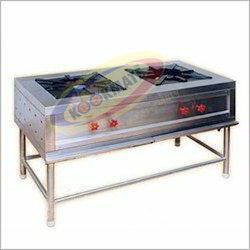 Matching up with the ever increasing requirements of the customers, our company is engaged in providing 2 Burner Gas Stove with Glass Top models and do have a wide range in Two Burner, Three Burner as well as Four Burner.